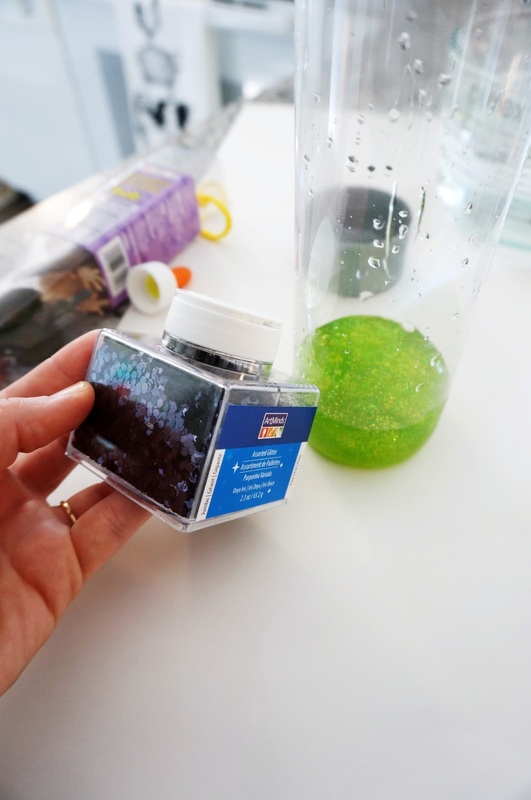 Earlier this year, I posted a tutorial for some very cool (if I do say so myself) coral reef sensory bottles. 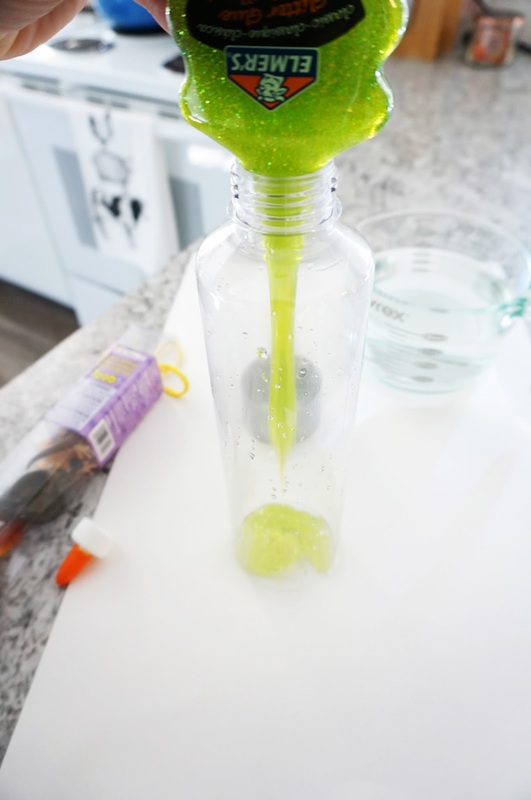 Sensory bottles are basically water-filled water (duh) bottles that can have a variety of items floating in them. Sometimes they are themed, and sometimes they simply contain a ton of glitter. Either way, they can be used for a variety of reasons. 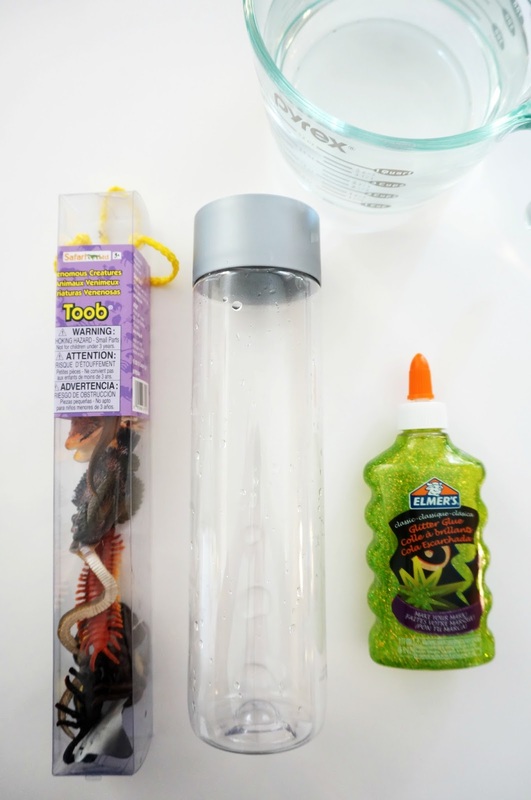 They can be used as ‘time out’ bottles, for when kids need some quiet time. They can also be used as stress relievers. 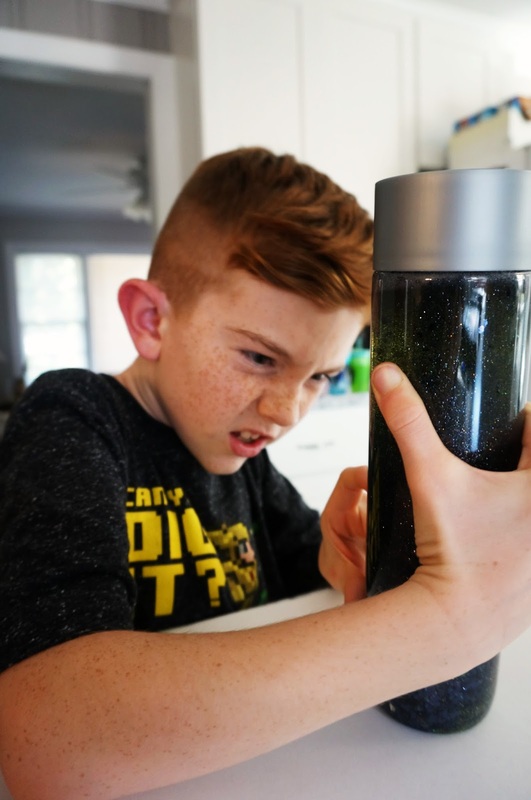 First, empty the entire bottle of glitter blue into the water bottle. 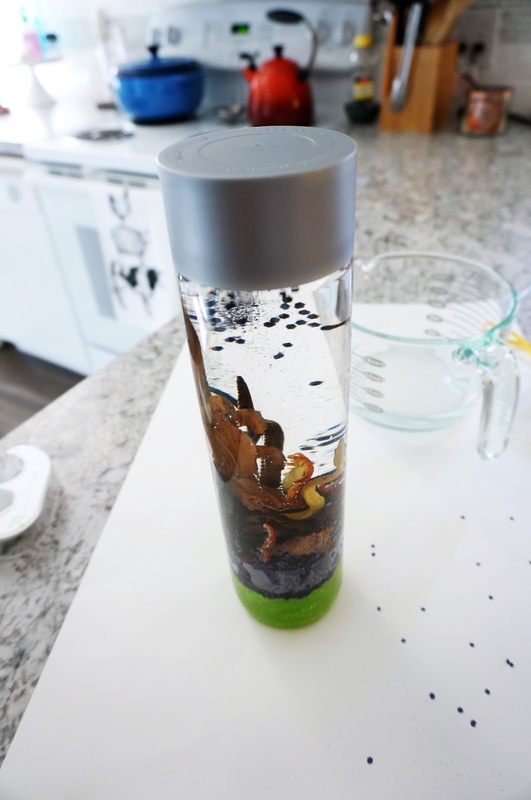 This will give substance to the water, so the items will move around instead of sinking to the bottom. 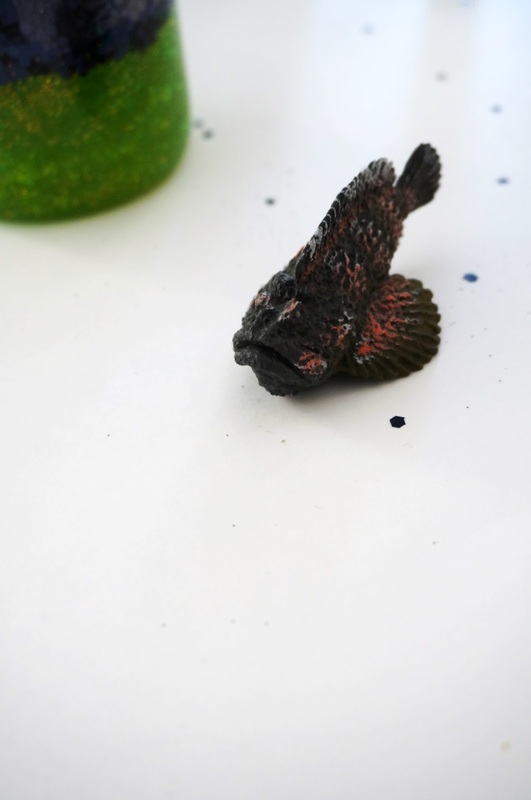 Next, add glitter. This is completely optional. 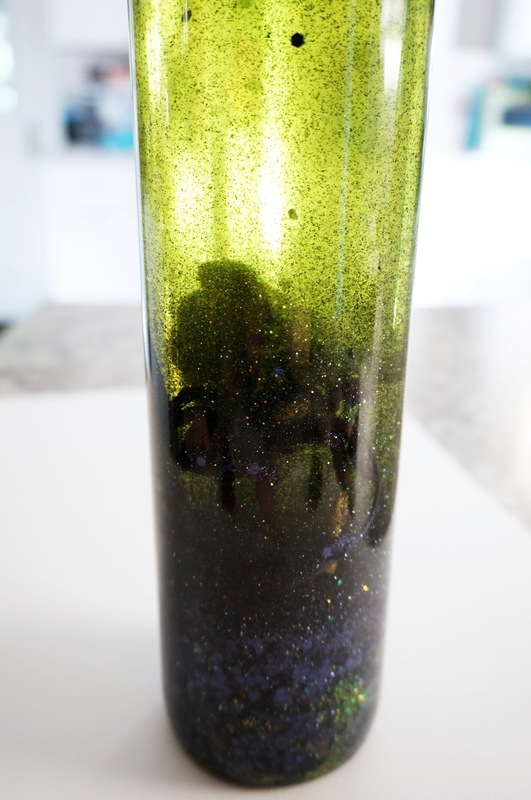 I wanted to add black glitter to go with the Halloween theme of lime green and black. 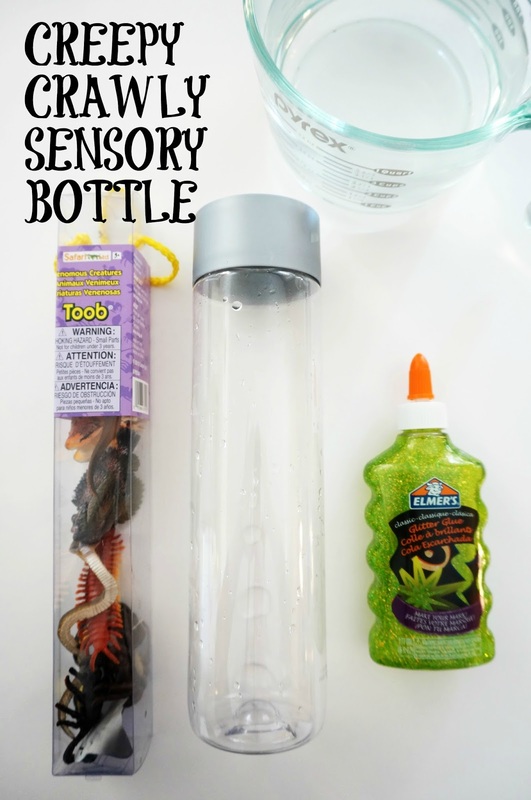 Next, add the items for the sensory bottle. You can use whatever you want. Large confetti looks very neat. 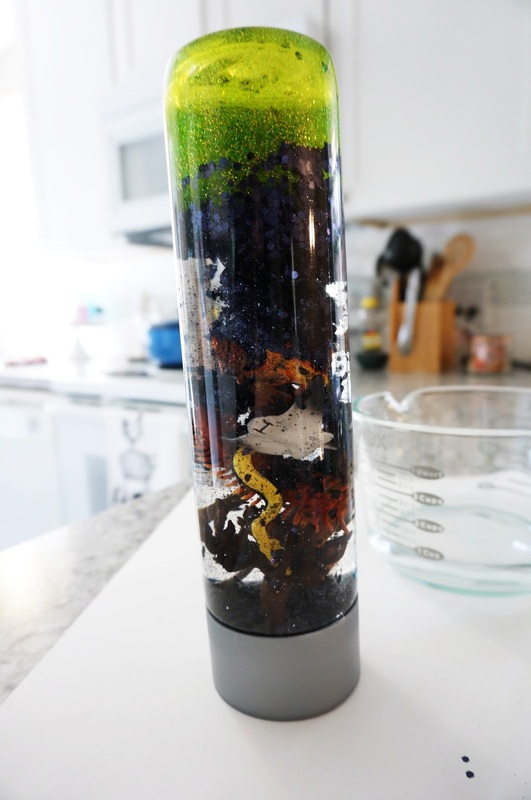 The last time, I used the coral reef Toob. If you’ve never seen Toobs, they are basically a plastic tube of plastic themed figurines. 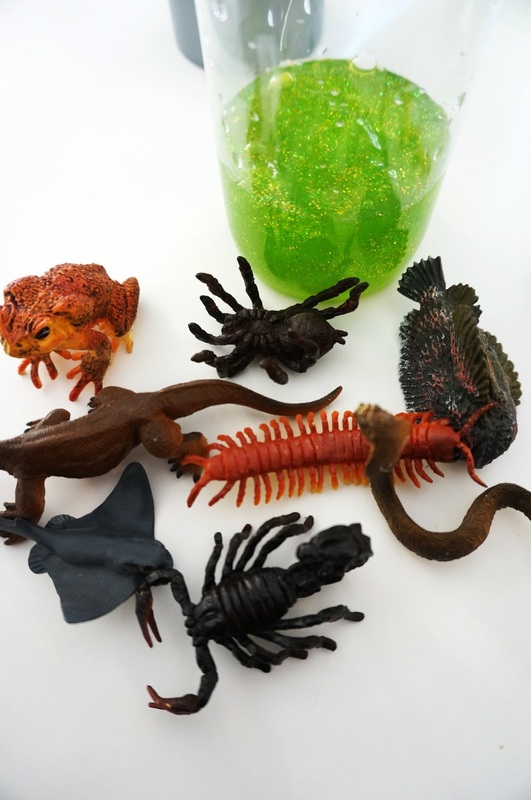 The one I am using for the Halloween sensory tube is called Venomous Creatures. Toob actually makes a glow in the dark Halloween Toob, but I couldn’t find at Michael’s. All of the figures in the Venomous Creatures Toob are creepy. so it definitely fits the theme! 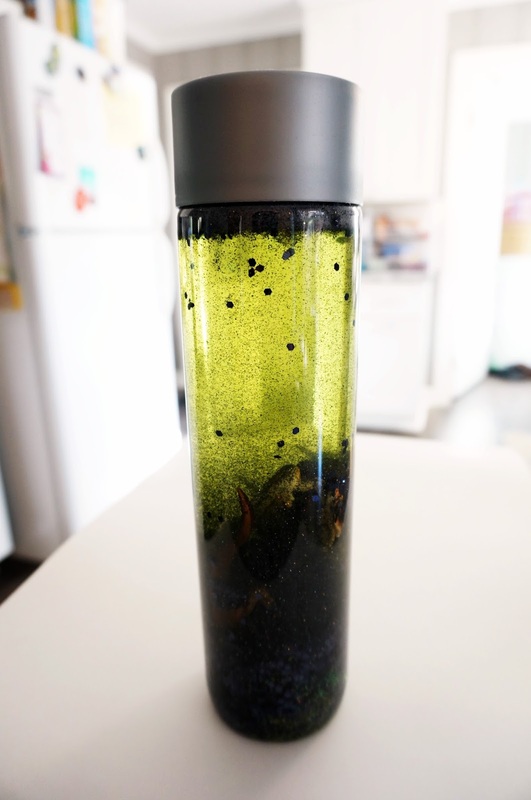 I’ve never had a problem squeezing items into our sensory bottles, until now. Mr. Pouty Face here couldn’t be squeezed in, so he got left out. 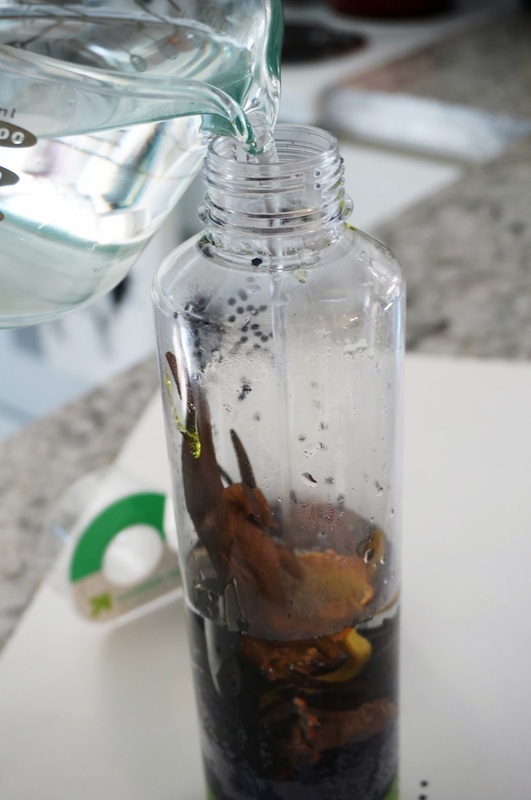 Next, fill the rest of the bottle up with warm water. 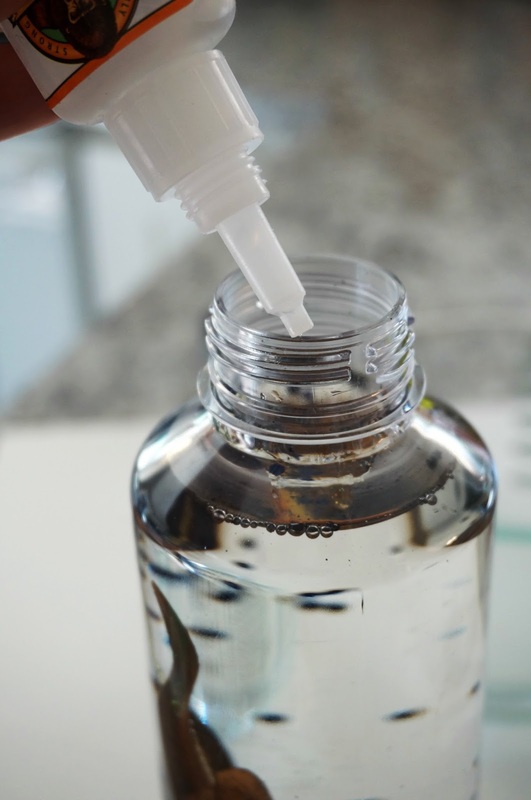 Apply some super glue along the threads of the water bottle, and close it! 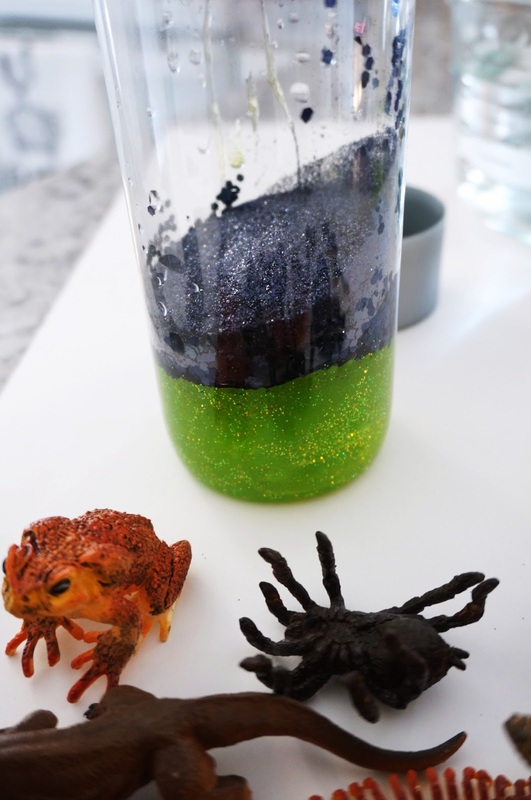 The glue and glitter will separate, but they are easily combined again when you shake the bottle. What kind of themed toys do you keep around for the holidays?